Hundreds of children from six city schools took part in storytelling and art initiatives at the Company Gardens today to mark World Book Day. 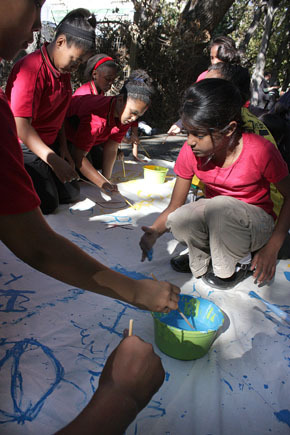 Organised by the City of Cape Town’s Central Library, children formed groups in the shade of the Company Garden trees in order to listen to renowned storytellers such as Philippa Kabali Kagwa and Rene Oeloff while others decorated canvases under the tutelage of graffiti artist Mak1one. Kagwa, who entertained the children with interactive folk stories, said storytelling “is the food of life” which helped children to “imagine another possibility”. She said children need to be “invited into the world of imagination” and taught to enjoy reading instead of being told that they should do so in order to pass examinations. Kagwa said reading helped people to “travel to places you might not visit” and should be an everyday fun experience. In the face of poor literacy levels in South Africa, Mak1one said celebrating a culture of reading should not be a one day event but an all-year-round practice. He called for more investment in books and school libraries and urged children to read as much as they could in order to harness the power of imagination. Inga Ndudula, 12, from Sea Point Primary school who was among the children taking part in the activities, said he loved reading because books provided him with company, helped him to relieve stress and taught him numerous things about life. Ndudula, who aspires to be a pilot, said his favourite books were comics. Schoolmate Sandrine Theron, 12, said reading increased her knowledge of the world. She said she liked getting books online as she was able to read them her mobile phone. Sonique Mbauya-Kayembe, 12, from Zonnebloem Girls Primary school, said reading improved her understanding of, and fluency in, English. She said when she finished school she wanted to be a journalist or an accountant. Schoolmate Siphesihle Shosha said reading books helped one become successful in life. Her dream is to be a fashion designer.